Sri Advaita Acharya was about 50 years elder to Caitanya Mahaprabhu ,and was born in a Varendra Brahmana family in the year 1434 AD. Some say that He was born in the village of Lauda, in Srihatta (present Bangladesh) while some claim that He was actually born in Santipur itself. His former name was Kamalakanta and His two wives Sita devi and Sri devi, were the incarnations of Yogamaya. Sri devi gave birth to one son named Syama Dasa, while Srimati Sita Thakurani was the mother of Acyutananda ,Krsnadasa, Gopala, Balarama, Svarupa, and Jagadisa Misra. Sri Advaita was initiated by the great Madhavendra Puri when he had once come to Santipur.Sri Madhavendra passed through Santipur while he was travelling to Orissa, in order to collect the required sandalwood and camphor for his beloved Gopala.’The Gaudiya treasures of Bengal’ has covered the journey of Madhavendra Puri and the pastimes of Gopala in detail in a different article entitled – ‘Sri Khirachora Gopinatha Temple, Balasore’. 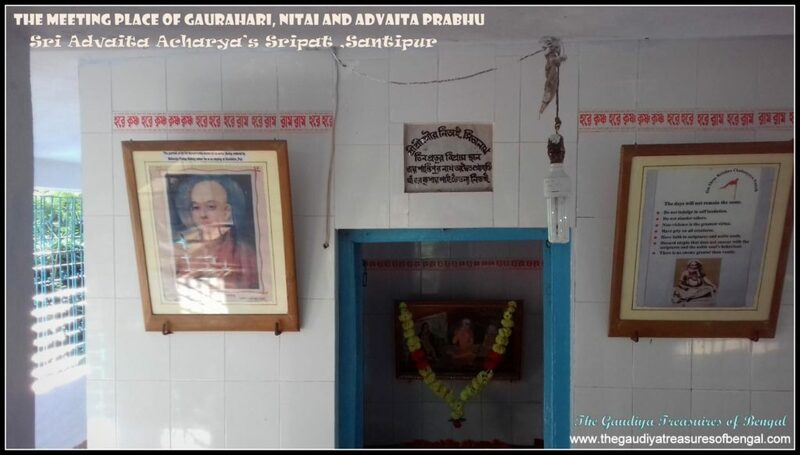 Sri Advaita Acharya had two houses – one at Santipur and the other at Navadvipa. Seeing the people of the world completely immersed in material activities and suffer greatly the pangs of material miseries, Advaita Acharya became pained at heart.Overwhelmed with compassion, He began teaching Bhagavad gita and Srimad Bhagavatam, by explaining their purports in accordance to the science of devotional service, and decrying the paths of philosophical speculation and fruitive activities. Srila Haridasa Thakura (refer- ‘Sri Haridasa Thakura’s Bhajana Kutira, Phulia’), Srivasa Pandita (refer – ‘Srivasa Angan ,Mayapur ,Navadvipa – Part 1: where Lord Gaurahari eternally performs His ecstatic pastimes’) and several other elderly vaishnavas, regularly congregated at Advaita Prabhu’s house and together discussed the glories of the Supreme Lord. Visvarupa, an expansion of Lord Balaram and the elder brother of Lord Caitanya, was also among those who graced His audience. Sri Advaita Acharya is also known as Gaura-ana Thakura, or who has caused the Supreme Lord Gaurahari to descend in this world. Seeing the degraded consciousness of people, Advaita Thakura began to ponder on how they could be delivered from the clutches of Maya. He concluded that only Lord Krishna Himself can liberate these souls from their suffering. Srila Prabhupada mentions in his purport that just as a condemned person is relieved by the special favor of the chief executive head, similarly, the condemned people in this age of kali can only be delivered by the Supreme Personality of Godhead or one who is empowered by Him. Sri Advaita Prabhu thought that His name ‘Advaita’ would befit Him, only if He could cause the Lord to descend and inaugurate the sankirtana movement. He knew very well that lord Krishna becomes indebted to a devotee and sells Himself to one who merely offers Him tulasi leaf and a palmful of water. Considering thus, Sri Advaita Prabhu began worshipping the Supreme Lord with tulasi leaves and Ganges water, calling for Him to descend, in His loud voice. 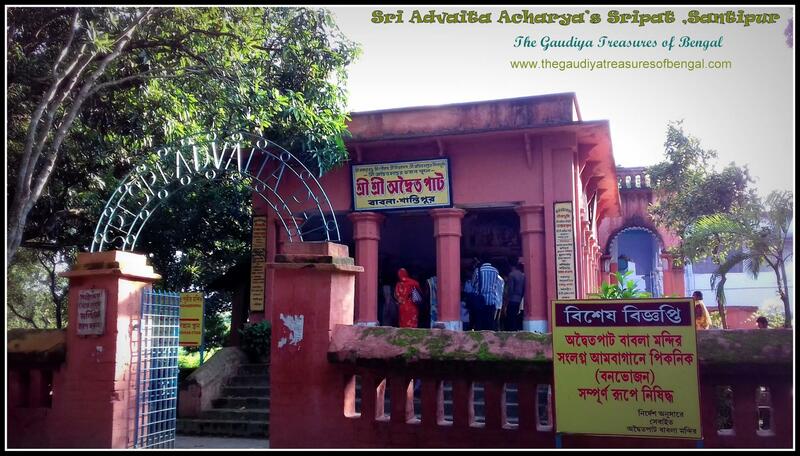 The place where Sri Advaita Acharya used to worship His saligrama sila with Tulasi and Ganges water, is presently known as ‘Babla’ (Advaita Thakura’s sripat at Santipur) and is situated not very far from the Santipur railway station. Being pleased with His prayers, the Supreme Lord, Sri Caitanya Mahaprabhu, descended upon this world, along with His personal associates (refer – ‘YogPeeth, Mayapur, Navadvipa – The birthplace of Sri Caitanya Mahaprabhu’). 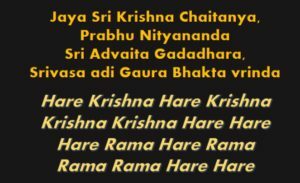 In Caitanya Bhagavata , the Lord reveals to His associates that it was Advaita Acharya, who had called upon Him and caused Him to descend from vaikuntha (‘mohare anila nada vaikuntha thakiya…’).Srila Krishnadasa Kaviraja mentions in Caitanya Caritamrta, that the merciful Lord Gaurahari had spread the sankirtana movement through Advaita Acharya and had delivered the world through Him. When Mahaprabhu was born, Sri Advaita Acharya ,in a very pleasing mood, began singing and dancing at His house here at Santipur. Everyone saw Him and Haridasa Thakura ,dance together in ecstasy, but were not able to comprehend the confidential reasons behind their actions. Taking advantage of the lunar eclipse ,occurring at that time, Sri Advaita bathed in the Ganges and mentally offered various charity unto the brahmanas. The very next day after the Lord had appeared, Srimati Sita devi, the wife of Advaita Acharya, arrived at the house of Jagannatha Mishra in Mayapur and blessed the new born child with many gifts and auspicious articles like fresh grass, paddy, turmeric, sandalwood, etc. She blessed the baby to have a long duration of life.In order to protect Him against ghosts and witches, she named the little child ‘Nimai’.It is said that the inauspicious ghosts and witches do not go near a Neem Tree and hence it was quite common in earlier days to plant a Neem tree in one’s house.Besides the Neem tree is also very famous for its antiseptic qualities.As the Lord was born beneath a Neem tree and as Neem drove away all ghosts and witches, Srimati Sita Thakurani named the little child as Nimai, a name by which the Lord came to be widely known later on. Advaita Acharya considered Lord Caitanya to be His master and Himself to be His humble servant. However, Sri Advaita Acharya was initiated by Srila Madhavendra puri, the spiritual master of Isvara Puri. Hence, Lord Caitanya, who had been initiated by Sri Isvara Puri, considered Advaita Thakura to be His elder and superior, as He happened to be the god brother of His spiritual master. Advaita prabhu was pained at heart to see Mahaprabhu treat him with such respect and so, seeking out the merciful punishment of the lord ,He once began teaching the path of philosophical speculation and dry knowledge to a few unfortunate individuals. He knew that His actions would enrage Mahaprabhu.When the Lord caught wind of this, He became extremely angry and immediately travelled to Santipur to give him a good thrashing.Seeing the Lord’s face that day, aroused fear within everyone’s heart. 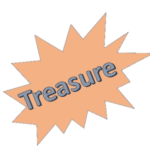 Arriving at Advaita’s house, the lord asked Him as to which was superior – Jnana (speculative knowledge) or bhakti (devotional service) ? The Acharya replied, that the path of speculative knowledge (Jnana) was superior. He further added that devotional service (bhakti) was of no use if a person was devoid of knowledge. As soon as the Lord heard this, He became mad with rage. 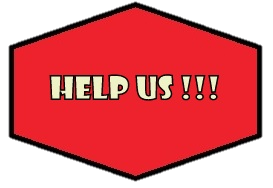 Dragging Advaita Thakura, out of His house, He threw Him into the courtyard and began beating Him very heavily.Advaita’s wife Sita Devi, knew the confidential reasons behind her husband’s actions, but still could not restrain herself and cried out “Stop ! Stop !”. She requested the Lord to pardon her husband and stop beating Him. She was afraid that He would die getting beaten.Lord Nityananda smiled hearing this and Haridasa Thakura kept fearfully chanting “Krishna ! Krishna!”. The Lord roared like thunder and said that He was resting peacefully upon the milk ocean. It was Advaita Thakura who had caused Him to descend in order to attend to His work. The Lord continued that it was Advaita Acharya who had engineered the propagation of devotional service. Now, it was He who was trying to obscure the sacred science of devotion by preaching the path of impersonalism. The Lord exclaimed that Advaita Thakura had deceived Him in all respects. Hearing the words of the Lord and receiving His chastisement, Sri Advaita Acharya became very happy.Clapping His hands, and dancing with joy, Sri Advaita remarked that the Lord had rightly punished Him. As a result He could now feel a renewed strength in His relationship with the Lord as His menial servant.Sri Advaita then joked that the Lord’s flattering words or the polite demeanor by which He used to previously glorify Advaita Thakura, had finally vanished while chastising Him. Kotha gela ebe tora se saba dhangati ? Actually Sri Advaita Thakura performed this whole drama, only to evoke the Lord’s transcendental anger and receive His chastisement. He wanted the Lord to treat Him as His servant.Through this pastime,Sri Advaita teaches us how auspicious it is to receive punishment from the Lord, or from one’s Guru. Lord Visvambhara then felt ashamed having chastised the Acharya so severely. Being very pleased, Lord Caitanya granted Him the benediction that if anyone took shelter of Advaita’s lotus feet, even if it was a worm or an insect, or even if the person had committed millions of offenses unto Caitanya Mahaprabhu, yet the Lord would readily grant that person His blessings. 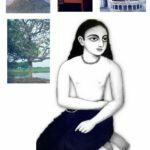 The Lord accepted His sannyasa order from Sri Keshava Bharati at the age of 24. Accepting His sannyasa, the Lord , out of an intense love for Krishna, started for Vrindavana. However in a state of trance, He wandered continuously for three days on the tract of land known as Radha desha (the western side of Ganges). The real purpose of accepting the sannyasa initiation is to engage oneself completely in the service of Mukunda (Lord Krishna). Likewise, Mahaprabhu decided to travel to Vrindavana and dedicate Himself solely unto the service of Mukunda,living in a solitary place.As Mahaprabhu was en route to Vrindavana, all the eight ecstatic symptoms, became simultaneously manifested in His body. 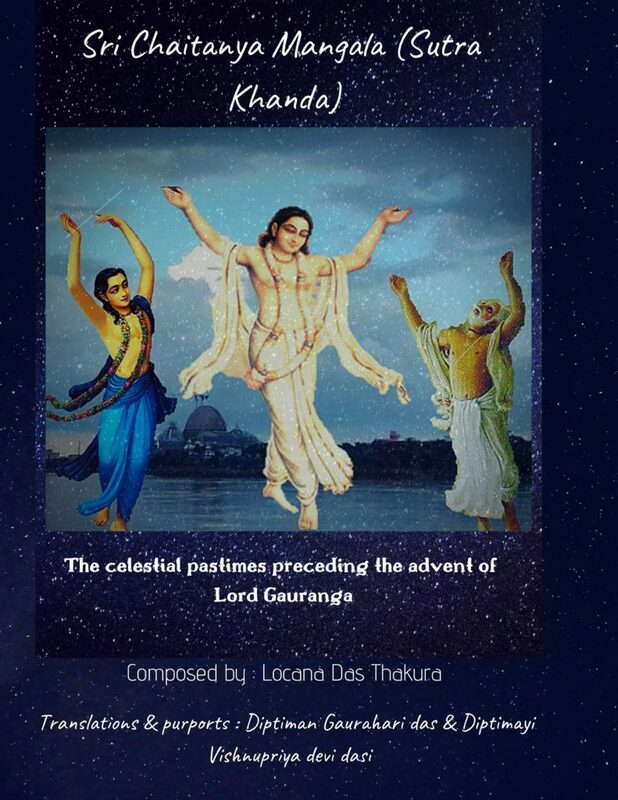 As the Lord thus travelled, Nityananda Prabhu, Chandrasekhara Acharya and Mukunda followed Him. The local cowherd boys who saw Mahaprabhu singing and dancing in ecstasy, joined Him in chanting “Hari ! Hari !”. Sri Nityananda Prabhu called these boys and secretly instructed them that if the Lord asked them the way to Vrindavana, they should show Him, the path to the bank of the Ganges instead. When the cowherd boys were questioned by Mahaprabhu about the path to Vrindavana, they showed Him the path towards the Ganges, and Mahaprabhu went that way dancing in ecstasy. Meanwhile, lord Nityananda requested Chandrasekhara Acharya to inform Advaita prabhu, that the Lord was coming towards the bank of Ganges at Santipur and that He should wait there with His boat.Thus being tricked by Nityananda Prabhu, the Lord travelled towards Santipur, instead of Vrindavana. On being asked, how far Vrindavana was, Nityananda prabhu pointed towards the Ganges and remarked that they have already reached the banks of Yamuna. Mahaprabhu was very happy to hear this and immediately offered His prayers unto yamuna. Thereafter mistaking the Ganges to be Yamuna, Mahaprabhu entered its waters and took bath. By this time , Advaita Acharya also arrived there with His boat. Seeing the Acharya, the Lord was taken by surprise and asked Him how He was there in Vrindavana. Advaita Acharya then disclosed the whole situation to Him and exclaimed that by the mercy Lord Caitanya’s arrival, the place had indeed been transformed into Vrindavana (..tumi yahan, sei vrindavana..). Lord Advaita further consoled the Lord by telling Him that He had indeed bathed in Yamuna. The two rivers Ganga & Yamuna meet at Allahabad (triveni), and thereafter they combine and flow down through Bengal. Yamuna flows on the western side and the Ganges on the eastern side of the combined river. Hence the Ganges ,here at Santipur was actually a combination of the two rivers flowing down from Allahabad. Hence the Lord who was on its western side, had indeed taken His bath in yamuna.This was Advaita Thakura’s logic.Thereafter on the invitation of Advaita Acharya, the Lord along with His associates, became His guests at His residence in Santipur and passed a few days blissfully together. Though the Acharya insisted that He had made a very simple arrangement for the Lord’s stay and Prasad, yet in reality He had prepared for a grand feast. All the various food items were cooked by His wife. Srila Krishnadasa Kaviraja concedes in Caitanya Caritamrta that it was not possible for him to describe the innumerable food items that were served on that day. After offering them to the deities, Sri Advaita prabhu seated the two brothers (Gaura Nitai) and made them honor these nectarian preparations. We are describing a few of them below for the pleasure of the devotees. Fine rice, yellow clarified butter, mung Dal (lentils), potol (Trichosanthes dioica), squash, man kachu (Giant taro), salad made of ginger and spinach, five types of shukto (a Bengali delicacy made of mixed vegetables), eggplant , phulabadi (a kind of dal preparation), a preparation made of coconut pulp mixed with curd and rock candy, banana flower curry, various kinds of sweetmeats and yogurt, sweet rice mixed with ghee, chipped rice mixed with bananas, etc were only a few of these uncountable items. There were hundreds of pots filled with various kinds of preparations.Lord Caitanya was very pleased seeing the arrangement and remarked that He would treasure upon His head ,life after life, the lotus feet of one who could offer such various delicacies unto Sri Krishna. But when Lord Caitanya was asked to honor this huge quantity of Prasadam, He was very reluctant. He argued that such varieties of food was not good for a sannyasi who needed to control His senses.Advaita Thakura then requested the Lord to give up His word jugglery and accept the prasadam. He cited that those foodstuffs were not even a tiny morsel before Him. Citing the example of Jagannatha Puri, Sri Advaita remarked how Lord Caitanya in His form as lord Jagannatha accepted food, fifty-four times a day. Thereafter, Advaita Acharya engaged in some jovial friendly conversations with Nityananda prabhu. Lord Nitai joked that after having fasted for three days, He had hoped to break His fast at the house of Advaita Acharya. But seeing the arrangements in front of Him, He had become very disappointed as the quantity of food would not even fill half of His belly.Advaita Acharya reminded Lord Nitai that He was a travelling mendicant surviving on roots and fruits.He joked that Nityananda Prabhu should not become overly greedy and instead gladly accept whatever food was offered to Him. In this way the two Lords tried to pull each other’s leg, and passed their time having a lot of fun. It is worthwhile mentioning here that Sri Advaita Acharya and Nityananda Prabhu had the utmost respect for each other and their friendly conversation should not be misinterpreted for an argument. After the two Lords have had their prasad, Sri Advaita accepted His lunch along with Mukunda and Haridasa and fed them as much as they desired. 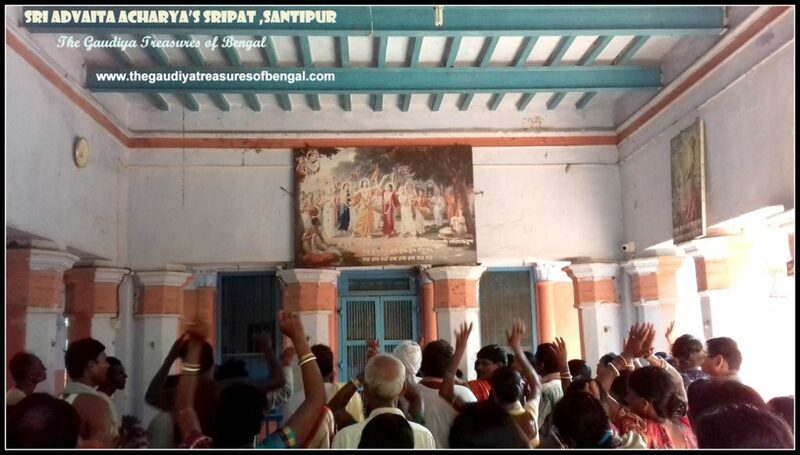 As the people came to know that lord Caitanya had come to Santipur, they started gathering at the residence of Advaita Acharya with the hope of seeing the Lord’s lotus feet. They became very pleased to receive darsana of the Lord. In the evening , the house of Advaita, was flooded with ecstatic dancing sankirtana in which Sri Caitanya and all His associates participated. In the morning, Chandrasekhara acharya brought mother Saci to Santipur.Seeing Her son again, she became overwhelmed. Seeing her son Viswambhara without His beautiful hairs,however, she became greatly agitated. Lord Caitanya immediately offered His prostrated obeisances unto His mother. Out of love she began to caress His body and kiss His face.She tried to observe Him carefully but could not do so as her eyes were filled with tears. Thereafter the devotees of Navadvipa met the Lord who was very happy to see them again.Srivasa Pandita and his family, Gadadhara, Gangadasa, Murari, Suklambara, Buddhimanta Khan, Nandana, Sridhara, Damodara,Mukunda, sanjaya, etc as if all regained their lives, seeing their beloved Lord again. Thereafter, Saci mata took up the responsibility of cooking for the Lord. The devotees passed their days singing and dancing in ecstasy. One day mother Saci requested the Lord to make Jagannatha Puri, instead of Vrindavana, His headquarters. She argued that Puri was quite near to Navadvipa and people often travelled to and fro between those two cities. Hence it would be easier for mother Saci to get the news of His son more frequently if He stayed at Puri. The devotees agreed and made the Lord aware of Saci devi’s request. The Lord became greatly pleased to hear the proposal and accepted it. After staying for a few more days at Santipur, the Lord requested for His leave.He assured the devotees that they shall soon meet again. He explained that sometimes they can all go and meet Him in Puri, while at other times, He would Himself come to Bengal, in order to bathe in the holy Ganges.Saying thus, the Lord circumambulated His mother and started for Jagannatha Puri. As soon as the Lord left, a great tumultuous cry filled the land ,air and sky of Santipur. Sri Srinivasa Acharya, the empowered incarnation of the Lord’s ecstasy, had also once advented to this holy land of Santipur, seeking the mercy of the senior vaishnavas and to take shelter of this transcendental abode. ‘Prema Vilasa’ describes his visit in detail. By this time, Sri Advaita Prabhu had already disappeared from this world .Srinivasa was confused as to where to go in Santipur.While wandering, Srinivasa suddenly saw a tall personality, whose body was lit with effulgence, standing right before him. The hands of this person extended upto His knees. Realizing that this person was none other than Sri Advaita Acharya (who had appeared to bless Srinivasa), he began to shiver and offered Him his respectful obeisances. Sri Advaita embraced Srinivasa and blessed him wholeheartedly, revealing that Srinivasa was destined to widely preach the glories of the Lord. He disclosed that in the near future , Sri Srinivasa would inundate the entire country with Lord Caitanya’s love and compassion. The acharya revealed that Srinivasa was destined to accept initiation from Gopala Bhatta Goswami. 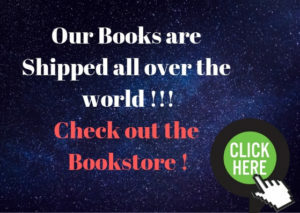 He also revealed that the books that were being compiled by Sri Rupa and Sanatana Goswamis in Vrindavana would be widely propagated by Srinivasa.Sri Advaita instructed him to travel next to Khardaha, where he could take darsana of Jahnava mata, following which he could proceed towards Vrindavana. Saying this Sri Advaita disappeared from his sight. Thereafter , Srimati Sita Thakurani, the wife of Sri Advaita prabhu, arrived at that place and invited Srinivasa to accept Prasadam at her home. Prem Vilasa states that the Prasadam ,Sita Mata cooked, tasted just like nectar and anyone who honored such Prasad would immediately be immersed in ecstasy. 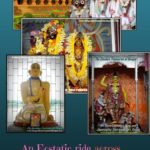 The details of Srinivasa Acharya’s journey is covered in a separate article entitled – ‘Sri Srinivasa Acharya’s Sripat, Jajigram (Near Srikhanda, Katwa)’. Sri Advaita Thakura manifested His transcendental pastimes for about 125 years and disappeared from this world around the year 1559 AD. Before the advent of Lord Caitanya, Sri Advaita had travelled to Gaya for performing the pinda Daan ceremony (last rites) of His father. He continued on His pilgrimage and subsequently reached Vrindavana. At Vrindavana He rediscovered the ancient deity of Sri Madana Mohana, which was originally established by Krishna’s great grandson Vajranabha and then was lost in due course of time. Sri Advaita re-established the worship of Madana Mohana jiu in Vrindavana, entrusting the deity service unto the hands of the priest, Sri Purusottama Chaube. We worship the lotus feet of our spiritual master ,whose causeless mercy has empowered us ineligible fools ,to gain entrance and take up service in this transcendental abode of Santipur. We seek shelter of this holy land, and pray that its glories remain forever imprinted in our heart.‘The Gaudiya Treasures of Bengal’ offers millions of obeisances and humbly prays to Sri Advaita Acharya that we advance in our Krishna consciousness, develop attachment unto the lotus feet of Lord Gauranga and are able to serve Sri Guru & Vaishnavas, by our honest and sincere efforts. We seek His blessings and compassion , in successfully rendering this humble service of reciting the pastimes and revealing the pastime places of the Supreme Lord and His beloved associates.We shall consider ourselves greatly fortunate and our existence meaningful if Lord Gaurahari and our dear spiritual master are kindly pleased with our endeavours. Sri Advaita Acharya’s bhajana Kutir and the place where He used to worship His Saligrama sila with Ganges water and Tulasi, thereby causing the descent of the Supreme Lord from vaikuntha. The place where the three lords (Gauranga, Nityananda and Advaita Thakura) used to regularly meet and plan for the propagation of their sankirtana movement. 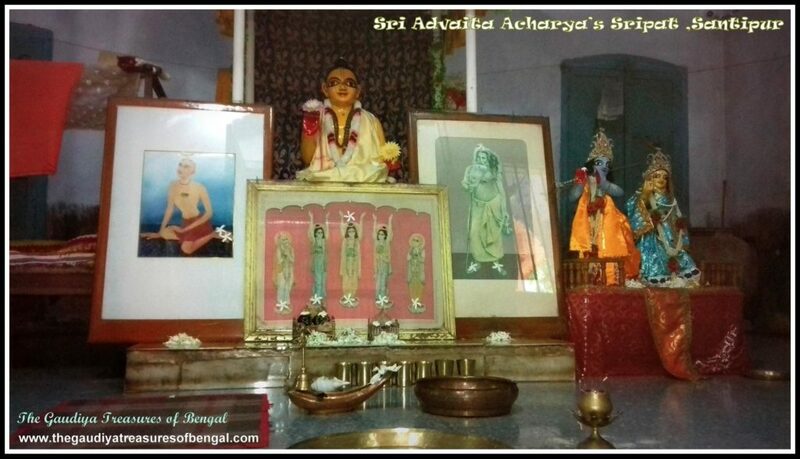 The temple is presently being taken care of and maintained by the descendants of Advaita Acharya. Srila A.C. Bhaktivedanta Swami Prabhupada used to often visit Santipur and pray to Sri Advaita Acharya for His blessings and empowerment ,so that he could fulfill the desires of his gurudeva by widely preaching in the west. 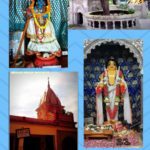 Every year ,on the divine disappearance day of Srila Madhavendra puri, a grand festival is organized at Santipur (santipur festival) , in which thousands of devotees are sumptuously fed. In 1989 the local Santipur authorities had requested ISKCON to take responsibility of this festival. The first Santipur festival consisted of only a handful of devotees but now around 40,000 pilgrims honour prasad. Lord Caitanya had once said that if one, on this auspicious day, either served or honored prasadam, then he would surely achieve the divine love of Govinda. Santipur is well connected to Kolkata via road and railways.One can board a local train from kolkata and reach Santipur within 3 hours. 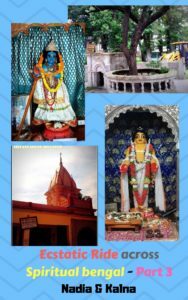 Sri Advaita Acharya’s Sripat is located at a place called Babla and can be reached by hiring a rickshaw from the Santipur railway station.We, from ‘The Gaudiya Treasures of Bengal’ ,however, had travelled to Santipur (sometimes also spelt as Shantipur), while visiting Sridham Mayapur. We had booked a cab from the ‘Gauranga Travels’ (office within Iskcon Mayapur premises) ,which then carried us to this ancient place. The journey from Mayapur to Santipur takes about 1.5 hours. Santipur is also very famous for its handwoven fabrics,super-fine-woven dhotis and jacquards.The handloom weaving style unique to this region is famously referred to as Santipuri Sari (tant). 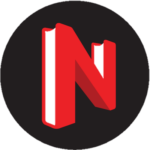 Accommodation – One can choose to stay in any of the prominent hotels of Santipur. Or else Iskcon Habibpur which is hardly a 30 minutes ride from this place also provides nice accommodations and prasadam facilities. Please contact +91 97321 85553 / +91 (3473) 281150 to book your rooms at Iskcon Habibpur.